There were various scenarios where we need to specify exception messages which can be easily understandable by the business user as with normal exception handling we cannot achieve this and needs to create the custom exception class every time. To avoid this I created a reusable component which gives the custom failure message based on the exception occurs in the script. This Reusable workflow will take System.exception as in argument and provides the custom failure message defined by the user in Mapping excel sheet which contains various exception types and messages as out argument. The excel mapping sheet can be customized by the user at any point in time. 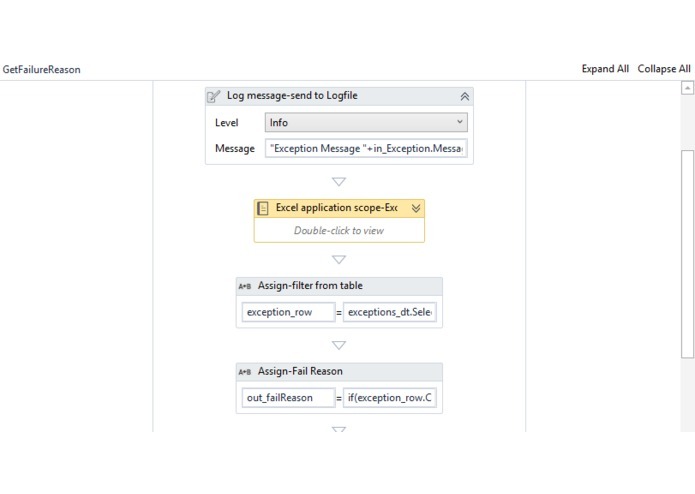 Example: If Uipath is unable to recognize any elements on screen it will give exception message as cannot find UI element corresponding to this selector, user can write customize message for this as UiElement is Not Present on the screen in our mapping sheet so whenever uipath encounters this exception type the failure reason will be the one mentioned above. So the challenge is when I want to define my own custom exception message regardless of the exception type then how to accomplish this?. So I used uipath.core.BusinessRuleException to define own custom exception messages and it will be handled in the reusable workflow. This reusable component is very helpful while implementing exception handling in the project as it helped in updating the user-defined failure messages in summary reports, log files and kibana reports.